Not even overcast skies could keep the trademark sunglasses away. A crowd of about 200 snaked their way around a downtown Victoria parking lot, waiting for their chance to meet one of the best professional wrestlers of all-time, Bret “the Hitman" Hart. He was recently in town for an afternoon autograph signing hosted by MVP Sports Collectibles that was later followed by an intimate VIP dinner with a couple dozen fans. Hart took his time with each individual and family who comes to the table, smiling and posing for pictures with everyone who asks. Kids wearing purple John Cena shirts are just as excited as their parents wearing vintage Hitman apparel. No doubt, many stories of the Hitman have been passed along over the past couple of decades. From DVDs to photographs to old magazines featuring the old-school metallic WWF logo, the assortment of memorabilia the Excellence of Execution signed was varied but nonetheless cherished. Hart listened intently to every story that was shared, smiling and engaging the excited crowd. He seemed truly touched to hear the tales about where the pieces he was signing came from and what they meant to his fans. It's not an exaggeration to say that Hart is one of professional wrestling's all-time greats. He started as a wrestling prince, the son of Stu Hart, one of the most respected men in the profession. One of 12 children, Bret followed in his father's footsteps, alongside many of his siblings. Beginning in the mid-1970s in Stampede Wrestling, which was run by his dad, Hart moved on to New Japan Wrestling to further hone his craft. In 1984, Hart debuted with WWE. Although he enjoyed some success wrestling on his own, it was when he teamed with his brother-in-law, Jim "the Anvil" Neidhart and formed the Hart Foundation, that the Hitman really started to click, both in the ring and with fans. After multiple tag championships, Hart continued to move up the WWE ranks, first holding for the Intercontinental Championship and then, at a 1992 Saskatchewan house show, the WWE Championship. Throughout the 1990s, Hart was one of the top stars in wrestling, holding the WWE Championship on several occasions. He left WWE in 1997 after the infamous "Montreal Screwjob" where he wasn't told he'd be losing his belt to long-time rival Shawn Michaels. Hart arrived in WCW shortly thereafter but injuries and poor booking decisions kept him from finding the same success there. Hart perked up when presented with old posters featuring him or his family members from the glory days of Stampede Wrestling. You could sense the nostalgia and memories come flooding back from the upward curl of his smile and raised eyebrows. Hart's memories of wrestling on Vancouver Island stray more toward his early career with Stampede Wrestling. He acknowledged that his memory of specific matches and opponents had grown fuzzy but he did recall other moments spent in the area. “Coming out from the Prairies in the wintertime and catching the ferryboat over here, I have a good memory of sitting there with Gene Kiniski and my dad, talking about wrestling and the old days that they had. Watching the whales jumping alongside the ferryboat was always a great memory for me. “Wrestling here in Victoria on that same trip, I don't really remember who I fought, maybe Bad News Allen, but, you know, I always loved the fans here. They loved their wrestling and they always had a place for the Hart boys. I always loved coming out here." 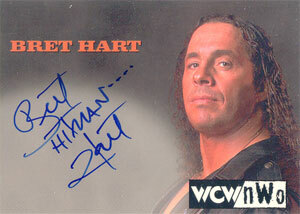 With such a storied career, there's bound to be plenty of Hitman memorabilia. Just don't expect to find many of the most important ring-worn pieces to show up. “I still got all my trunks and all my tights. I don't give it away. It's pretty sacred ground. I'd be hard-pressed to find a reason to give it to somebody else. It's very valuable to me." Although keenly aware of his own personal items, Hart admitted that he didn't follow the secondary market for his trading cards and other pieces of commercial memorabilia. When told that he had an autographed card from 1999 Topps WCW/nWo Nitro that regularly sells for three figures, Hart said, “I hope I'm competitive in that regard as everything else." He also couldn't resist the opportunity to throw a jab at a long-time rival, “Who wouldn't want a Bret Hart autograph over a Hulk Hogan autograph?" Although the likes of lesser stars Koko B. Ware, the Bushwackers and Akeem have appeared in multiple Topps sets in recent years, alongside other legends and Hall of Famers, Hart hasn't been in a mainstream wrestling card set since his days with WCW. He was included in the multi-sport Sportskings set last year. He did say that he was certainly open to the idea of appearing on cardboard once again, “They're welcome to get a hold of me," Hart said of Topps. Like a lot of athletes and public personalities, Hart is getting more involved in social media. Fans can find him on Facebook where he offers regular updates of personal appearances. Fairly new to Twitter, Hart has already amassed over 135,000 followers. “It's fun. You can tweet about hockey and not just about wrestling. It's kind of a nice way to stay connected with the world so I'm kind of liking it." Although not a regular on TV now, Hart has appeared periodically as a guest star on WWE programming since making amends in December, 2009 and appearing on the first Raw of 2010. He still keeps up with the current professional wrestling scene and was happy to offer some of his favorites in the industry today. The first names out of his mouth were the Bella twins, Brie and Nikki. “They're getting better and better. I like Daniel Bryan. I love his style. I love his incorporation of actual wrestling holds and submissions and his style. I'm a big fan of Cena. I'm a big fan of Orton." He had kind words for the today's generation as a whole, “I have a lot of respect for all the young wrestlers today. They're really exceptional athletes and exceptional, decent, hard-working kids who are really a credit to the profession." With all the accolades from his storied career, it's not championships or matches that Hart holds as his greatest accomplishment. It's his memoir, Hitman: My Real Life in the Cartoon World of Wrestling. “To be able to get that done and write through the turmoil of my stroke and Owen's passing and the British Bulldog's passing and some of my other wrestling friends and be able to focus and distract myself and put everything I could in that book will always be my greatest achievement," he said. Although still in the planning stages, Hart is hoping to write a follow-up to the best-seller. He said it could take years for it to come out, but hoped that someday it would. “I'm just waiting as my life continues to unfold," Hart says. He continues to work with WWE, having appeared on the August 26th episode of Smackdown that was taped in Calgary. Over the summer he also went on tour with the company in South Africa, a testament to his continued global popularity despite having been largely out of the public's attention for the better part of a decade. After all these years, Hart still commands a crowd. They were excited to see him and he seemed to return the favor. As a legend, he could do what he wanted, even if that meant wearing sunglasses on a cloudy day. Great article… just came across this today.. good read and very cool that you got to spend any amount of time with Hart. He is indeed the best there was, the best there is and the best there ever will be. Adam (ID 25536) � Thanks, Adam.